Two days later, two crude pressure-cooker bombs set off by Tamerlan and Dzhokar Tsarnaev tore through the Boston Marathon. More than 250 people were injured. Sixteen people lost their legs. Three victims, 29-year-old Krystle Campbell, 23-year-old Lingzi Lu, and 8-year-old Martin William Richard, died. Three days after the attack, Wai Kru’s parking lot was flooded with federal agents and local police. 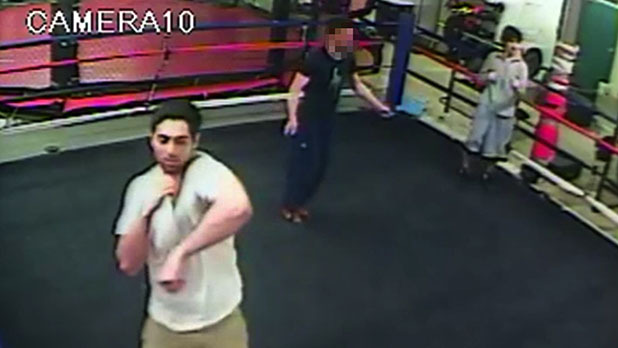 Tamerlan Tsarnaev, by then the primary suspect in the bombing, had trained at his gym for years. Allan warned police about another gym member associated with Tamerlan, Ibragim Todashev; told his staff to fully cooperate; and booked a flight home. By the time Allan touched down, MIT Police Officer Sean Collier had been murdered, Tamerlan was dead, and his younger brother, Dzhokhar, was in custody after an unprecedented manhunt. It’s a Wednesday afternoon in late November and Allan is eagerly pacing around his gym. This is the first week of John “Doomsday” Howard’s training camp. The 5’7″, 171-pound welterweight is preparing for UFC 168 in Vegas where he’ll battle Siyar Bahadurzada, a 5’11” fighter born and raised in Afghanistan. Doomsday is perhaps the last beacon of hope for a gym that, against the odds, has stayed in business after a disastrous year. One of Allan’s instructors left a few weeks after the bombing, taking dozens of clients with him, and monthly revenue plummeted by as much as $8,000. The gym, which runs free after-school programs for high school students and often has a pay-when-you-can mentality, is struggling with finances and morale. A major UFC win would be one of the first positive public moments for Wai Kru in years. Besides its association with Tamerlan and the bombing, there was the brutal triple homicide in 2011 that left three gym members dead, including Brendan Mess, who was a close friend with Tamerlan. Allan is hoping to instead connect Wai Kru with Doomsday, a rising star in the UFC. “Doomsday winning is what everyone in Wai Kru wants. Whether it’s the doctor or lawyer who comes in for exercise or the amateur fighter here who hopes to break into the UFC,” says Allan. For Doomsday, a Boston native, a win in Vegas is redemption, a way to cement his presence in the most popular fight promotion in the sport. Doomsday started strong in the UFC, winning four consecutive fights, two by knockout. Then he went cold: A loss by TKO after Jake Ellenberger split his eye followed by two unanimous decisions against him. The UFC cut him. He was only allowed back in when there was a spot to fill at a fight in Boston a few months after the bombing. The hometown hero fought up a weight class against Uriah Hall and won by decision. Still, UFC boss Dana White wasn’t impressed. 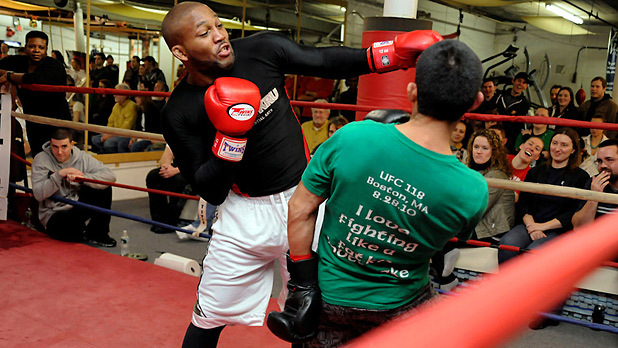 John “Doomsday” Howard, training at John Allan’s Wai Kru gym in Boston. John Allan is muscular and handsome, with big, expressive brown eyes and an ever-present smirk. Most days he wears a black Wai Kru hooded sweatshirts and blue Adidas track pants with a black Wai Kru baseball cap. He’s a proud card-carrying medical marijuana patient, which he uses daily. He walks and talks non-stop, always pacing, giving orders, turning to his phone to text with his stunning German fiancée, and chatting with everyone who passes through the gym’s door. “It’s like trying to work with a Tasmanian devil,” one of his employees says. Allan grew up in Walpole, a sleepy town between Boston and Providence whose primary landmark is a maximum-security prison. He eventually ended up at Boston College, wrestling a semester and studying philosophy and theology. It was then he began meditating and noticed that the left side of his body fatigued after a few minutes. “That’s why I started doing Muay Thai. I decided to learn it left handed to strengthen that side of my body,” he recalls. It wasn’t long before he was fully immersed in the world of Martial Arts. He experimented with Jeet Kune Do, Bruce Lee’s wildly interpretive style. In his early 20s, he went to Japan for six months to study judo. From there he bounced to Thailand: “In Thailand there’s no beginner class.” Allan spent the next decade traveling regularly between New York and Southeast Asia. In the States he’d piece together odd jobs, dabble in music production, and line up martial-art instruction gigs. In Thailand he’d visit obscure Muay Thai camps. Process and mechanics fascinated Allan, and he took to teaching. In his early days at Wai Kru, Tamerlan worked hard, focused on winning the Golden Gloves so he could box for the U.S. in the Olympics. As major events approached, Tamerlan’s stoicism gave way to flair. “When he shows up at the Golden Gloves for the first time, he’s wearing white boots, a flowing scarf, and there was a piano,” Allan recalls. Tamerlan belted out 45 seconds of concert piano, “like Tchaikovsky,” and then weighed in, fully clothed. Tamerlan didn’t initially like Todashev. They became closer after his dreams of qualifying for the Olympics were dashed thanks to a change in Golden Gloves regulations concerning non-citizens. Tamerlan’s boisterous nature soon earned religious undertones, says Allan, and his friendship with Mess disintegrated. Tamerlan (foreground) and Dzhokar (back right) training in the boxing ring. On Sunday, September 11, 2011, two people allegedly entered the Waltham apartment where Brendan Mess was hanging out with Raphael Teken and Erik Weissman. There were drugs and money in the apartment, and a vicious struggle ensued. All three men had their throats slit so severely that they were nearly decapitated. Tamerlan came to Wai Kru the next day, laughed off the savage murder, and skipped Mess’ funeral. The case went cold until May 22, 2013, when an FBI agent shot Todashev seven times during an interrogation at Todashev’s Florida apartment. A newly released FBI report says that Todashev confessed to playing a role in the triple homicide, then went berserk, threw a coffee table and charged the agent with a metal pole. The bewilderment that washes over Allan when discussing Tamerlan vanishes when he’s with Doomsday. It’s late December, snowing steadily in Boston. In the steamy basement gym, Allan is taking a padded pummeling from Doomsday. After three minutes of intense sparring, Allan makes Doomsday sprint back and forth across the mats before jumping into another sparring session. Allan then pulls a nearby student from a Muay Thai class whom Doomsday must lift up and carry across the mat between punch combinations. No two training days are alike with Allan. “He is one of the craziest coaches I’ve ever had in my life. He mixes it up like there’s no routine,” says Doomsday, who is named after the comic book villain that killed Superman. The creature’s special power is the ability to come back to life, impervious to whatever previously killed it. It’s a trait, Doomsday says, that not only applies to him, but to Allan and the entire Wai Kru camp. “We learn from our mistakes,” he says. A week later, Doomsday and Allan march through Las Vegas’ MGM Grand Garden Arena and into the octagon to fight Siyar Bahadurzada in UFC 168. Halfway through the second round, both fighters are visibly gassed. With 30 seconds left, Doomsday hoists Bahadurzada onto his shoulder in an astonishing display of strength, stumbles across the octagon so that he’s directly in front of a screaming Allan, and crushes his opponent into the mat. The crowd erupts. Social media and MMA blogs light up, the type of viral highlight UFC brass loves. Though the fight goes another full round, Dooomsday wins by unanimous decision. Doomsday’s devotion is immensely reassuring to Allan. “Doomsday is like a brother,” he says. “I owe a lot to him and he owes a lot to me.” The win has helped breathe new life into Wai Kru, and they’re looking to capitalize on the momentum on April 11 – days before the first anniversary of the bombing – when Doomsday takes on Ryan Laflare for UFC Fight Night 39 in Abu Dhabi. A victory there could earn Doomsday a top 10 ranking and pave the way to a title bout. Doomsdays’ victorious body slam at UFC 168, in Las Vegas. Allan still gets calls from investigators. Journalists continue to hound him and show up unannounced at the gym. There are questions he’ll never be able to answer. A federal agent once told Allan the ability to knock a man out with one punch or execute a deadly chokehold is important to someone intent on carrying out a bombing in the middle of one of Boston’s most historic and crowded events. “Wouldn’t you go to the best gym and train yourself to be a human weapon?” Allan recalls an agent asking him.